Kasugai Fruit Gummy Candies have a reputation for being the best-tasting gummies available anywhere. The hype surrounding these is incredible (they contain real fruit juice), so I’ve wanted to try them for some time. I recently purchased a bag of their lychee-flavored gummies. The lychee is a Chinese fruit with a rough outer skin and a soft, juicy interior. Simultaneously tart and sweet, the lychee sort of tastes like a mixture between a pear and an orange, with a strong undertone of rose. Yes, the flower. I opened the bag up and was nearly overwhelmed by the smell of acetone, i.e. nail polish remover. It only partially resembled the gentle, fragrant scent of a fresh lychee, and I started to second-guess my choice. Maybe I should have picked up the apple or the peach instead? Each gummy was individually wrapped, and I did really like the pastel purple color of the wrapper. When I popped the first one into my mouth, the fresh flavor of lychee burst onto my tongue. The gummy texture isn’t too chewy or too soft. It’s (to borrow a phrase from Goldilocks) just right. The taste fared even better when I just let the candy linger against my cheek without chewing on it. It was like eating a mouthful of actual lychee fruit. I was very impressed! Was I blinded by the hype surrounding Kasugai gummies and my love for lychee? I offered one to my boyfriend (who isn’t a lychee fan) and he dutifully ate one, even though he was turned off by the smell. His verdict: “I can honestly say, I could have lived my entire life without having this taste in my mouth.” Still, he was brave enough to finish the candy without spitting it out. I guess lychee is an acquired taste, but these candies do taste a lot like their real life counterparts, and at around $2.50 a bag (or less, depending on where you purchase it from), they’re not a bad deal at all. They’re a perfect introduction to Japanese candies, and they come in a wide variety of flavors: lychee, lemon, kiwi, pineapple, grape, melon, strawberry, apple, mango, and orange. The honeydew melon ones are by far the best tasting. I’ve tried a lot of these and they all taste very good. A soft and easy chew with a lot of juiciness…kind of a weird way to describe a gummy, but they do taste more natural than most candies. Lychee is definitely an acquired taste, most people I have try it don’t care for it. I’ve tried these before and they’re pretty good. In fact, I think I’ll pick some up tomorrow. Have you tried the larger lychee treats? The ones that have a little liquid in them? Those are good too! My wife is Japanese so I get to the Asian market frequently. I often pick these up and keep them handy to munch on as a snack. I like their various kinds of grapes, melon, apple, and mango. How ironic, i just got the apple versions of these a month ago at a chinese super market. They were a little dissappointing, thought it was going to be sweeter and less apple-y, i know that’s stupid, but it was not what i was expecting. I love the kiwi, if I remember right it has little kiwi seeds in it as well. I LOVE these gummies. I always buy them when I can, sometimes at asianfoodgrocer.com, and sometimes i’m lucky enough to find that damn candy store in New York’s Chinatown (Boston’s is overpriced). These and the muscat are my favorites. This may be a shot in the dark…but I am looking for a Japanese (I think) candy that a friend brought over a few years ago. It was a gummy clear/white outside…sort of powdery on the outside….and had an almost fig newton-type filling. It was on a stick. Anyone have any clue? Thanks! I LOOOOOVE the Kasugai Gummies. I recently purchased 3 bags of strawberry flavored Gummies. I ate the first bag in like 10 minutes too!!! 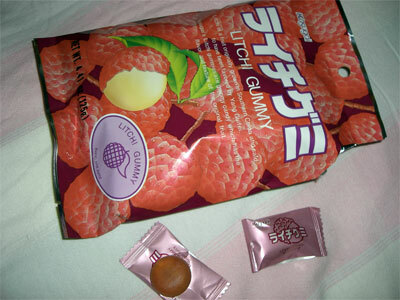 I am wondering where i can buy the larger lychee candy, the one individually wrapped with the juice in them too. They are so good. I’m fairly certain they have a peach flavor as well… I remember having some once unless I’m mistaken. But the flavor is fantastic and very addicting. I love these gummies! Can anyone provide me with a list of ingredients for the Orange gummy candies? I only have some individually wrapped candies given to me by a friend and and I have some allergies. Thanks! According to asianfoodgrocer.com, the ingredients include: Sugar, corn syrup (corn starch, water), gelatin, concentrated lemon juice, oblate powder, D-sorbitol, acidulant (citric acid, sodium citrate), pectin, artificial lemon flavor, palm oil, emulsifier (glycerin fatty acid ester, soybean lecithin), coloring (beta carotene), contains milk ingredients. Do you know what type of product is used to make the gelatin? I go to the Asian market often and would really like to try them, but I’m unsure of the gelatin used.